One of the most eminent encyclopedians of the Bulgarian Revival period - a doctor of medicine by education, he was also very much concerned by business matters, economics, geography, industry, transportation, philology, journalistics. He had a leading role among the uilders of Bulgarian literary language with his First Grammar of Bulgarian Language (1844), as well as with the first ever French-Bulgarian and Bulgarian-French Dictionary. He had also had a leading role in publishing the first Bulgarian newspaper - Bulgarian Eagle (1846), which appeared two years after the first BG magazine - Konstantin Fotinovs Lyuboslovie (i.e. Love to Language). Born in 1818 in the town of Karlovo, Ivan Bogorov studied in Constantinople and in Kouroucheshme (in the Greek parish school, where G.S.Rakovski and Sava Dobroplodni also studied). At the age of 19 he went to study at the Richelieu High School in Odessa, Russia (which was the place where Nayden Gerov, Botyo Petkov and Dobri Chintulov received their education). 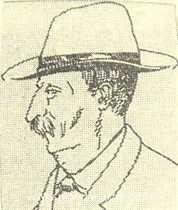 Bogorov lived in Leipzig, Germany, where he founded the newspaper Bulgarian eagle -a civil, trade and literary newspaper. Then he lived in Constantinople where he wrote for the Constantinople Newspaper, trying to urge the eminent Bugarians, having high-ranking positions in the turkish Empire administration, to use their influence in favour of Bulgarian independent church. He studied Medicine in Paris, then went back to Constantinople again, then he was a doctor in Plovdiv, where he was publishing his Journal of Science, Crafts and Trade. In Bucharest, Romania, he published his newspaper Nationality and prepared his Academic Dictionary of Bulgarian language. During the Russo-Turkish War of Liberation (1887-1888) he volunteered as a translator of the Russain Military Commandment. He lived another 14 years in liberated Bulgaria, and died in 1892.